Even with today’s online photo hosting services most people still prefer to send photos by email. 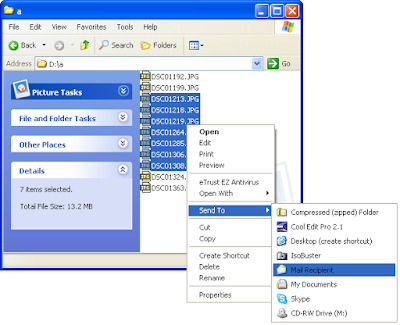 If you owning a recent digital camera most probably each of your JPEG photos will take between 2 to 5 MB. It’s easy to see that only a couple of these hi-resolution photos may be big enough to flood and block recipient’s mailbox. 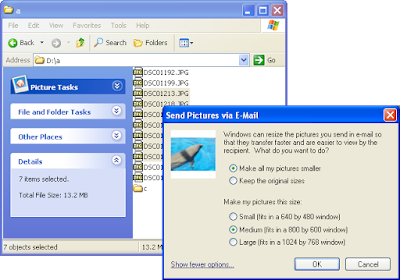 This post will assume that you are using Windows XP with a local email client (Outlook Express). Actually the above method is OK only if you want to send your friends the original hi-resolution version of the photos, or if you are sending already resized photos. Your friends will not get the original version of the photos, but a scaled down version. This is OK in most situations. 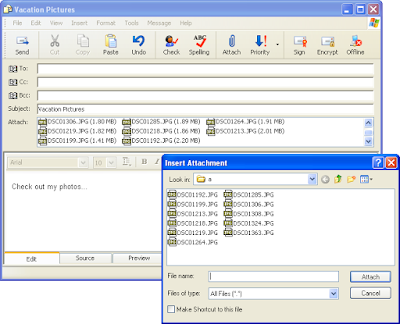 If one wants to print photos then you can always send the hi-resolution version at a later time.